A 210-foot construction crane collapsed and struck three buildings, killing one person inside a top-floor apartment that was crushed, authorities said. The crane was working on a vacant office building in downtown Bellevue, a Seattle suburb, when it toppled Thursday night, fire department Lt. Bruce Kroon said. The operator told rescue personnel he was preparing to shut down for the night when he heard a crack just before the crane plummeted. 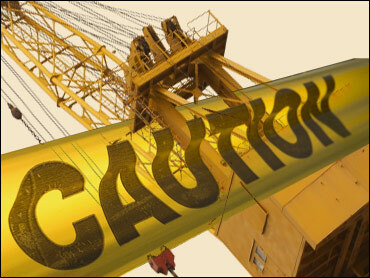 The crane operator suffered minor injuries but was able to pull himself out of the cage, which was about 20 to 30 feet above the ground, Kroon said. Firefighters used a ladder to carry him to safety. Dozens of residents, diners and others were evacuated from the damaged buildings as firefighters went through each building to check for others who might have been hurt. "If this occurred an hour earlier, it could have been a lot worse," Mayor Grant Degginger said. The crane had been anchored in a pit about five stories deep, and the wreckage was left hanging over the street while safety investigators from the state Department of Labor and Industries were brought in. "I heard this rumbling like thunder, getting louder," said Linda Rosario, 42, who was about three feet from a window in the apartment directly below the one where the man was killed. "I guess it wasn't my time." The crane was initially reported to be owned by Ness Cranes, but a man who answered the phone at the company's Seattle headquarters Friday denied it. "It's not our crane. We were operating it, but it was owned by someone else," he said, refusing to give his name or the name of the company that owned it. Company executives were in meetings and would not be commenting on the accident, he said. Ness Cranes was involved in a 1994 accident at the old Kingdome in Seattle that killed two construction workers in a 250-foot fall. The company's Web site says it has "made major strides in upgrading our safety program" by designating a safety director and offering workers incentive for meeting safety goals.